This article is intended to give you a high-level overview of how to navigate through the Expense Accounting Excel File. I’ll be explaining the purpose of each tab and point out which columns you should pay attention to. In the summary tab, you will find three sets of Journal Entries that you will book at the end of each reporting period. The first portion is your Stock-Based Compensation Expense, the second is related to Early Exercises and the third is related to regular exercises. Click here for more detailed information on these Journal Entries. The Cost Center tab will allocate your current expense based on Cost Center. This information is taken from the Carta Stakeholders Page under “Stakeholder Properties”. The "effective date" of each cost center will apply based on the vesting schedule of each award. For example, if you have a vesting tranche that vests on 1/1/2017 and you use an effective date of 2/1/2017, then the 1/1/2017 tranche will listed as N/A. Please make sure that the effective dates are in line with the vesting schedule. Click here for more detailed instructions on how to update cost centers. 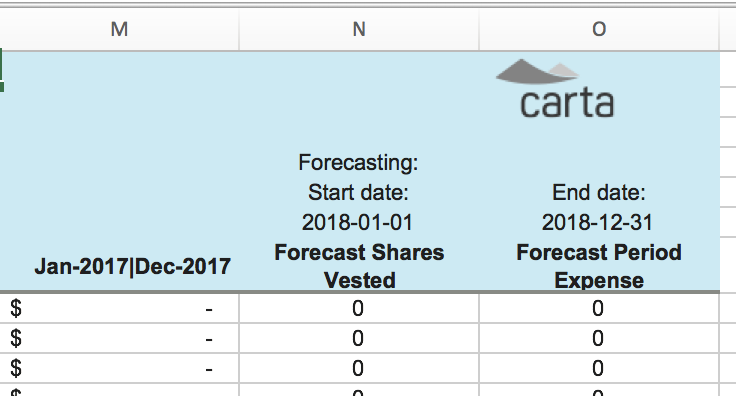 The Forecast Data tab will contain a list of all your awards broken down by vesting tranche and is used to calculate the forecasted expense that we referenced in the Grants tab. Carta uses the Black-Scholes Option Pricing Model to assess the fair value of Stock Options. Within the Fair Values tab, you will find all of the assumptions that go into the Black-Scholes calculation. You will find the output of the model under the column labeled “Option Value”. The “Option Value” will be the cost basis of your Stock-Based Compensation Expense. Each of the five inputs for the Black-Scholes model will be in this tab. The next four tabs that we will talk about will contain the data that is used to calculate these assumptions. Click here for more information on the Black-Scholes Option Pricing Model. The Interest Rates tab will contain a data download of the daily US Treasury Yield from the Federal Reserve, which is used to calculate Interest or Risk-free rate for the Black-Scholes Option Pricing Model. Within the Grant Date report, we do the calculations on the backend to allow the excel file to generate quicker. Within the Mark to Market report, you can find the Interest Rate calculation in the "Jan-2017|Dec-2017" tab under "Current Period Volatility". Click here for more detailed information on this calculation. Within the Peers tab, you will find the daily closing prices of your Public Peer Companies, which is used to calculate Volatility for the Black-Scholes Option Pricing Model. Carta pulls this data from QUANDL or CAPIQ, based on your company's specific settings. If you revert back to Fair Values tab, you will find the calculated Volatility of each award. Within the Grant Date report, we do the calculations on the backend. Within the Mark to Market report, you will see the calculations in action if you navigate to the "Jan-2017|Dec-2017" tab under "Current Period Volatility". Click here for more detailed information on our Volatility methodologies. The Expected Term tab will contain all of your option grants broken down by each vesting tranche in order to calculate the Expected Term input for the Black-Scholes Option Pricing Model. The main column that you’ll want to pay attention to is the Weighted Time to Vest. This column is calculating the difference between the vest date and grant date multiplied by the number of shares. Click here for more information on our Expected Term methodology. This tab will contain a table of your Fair Market Values of each share class and is also used as an input in the Black Scholes Option Pricing Model. 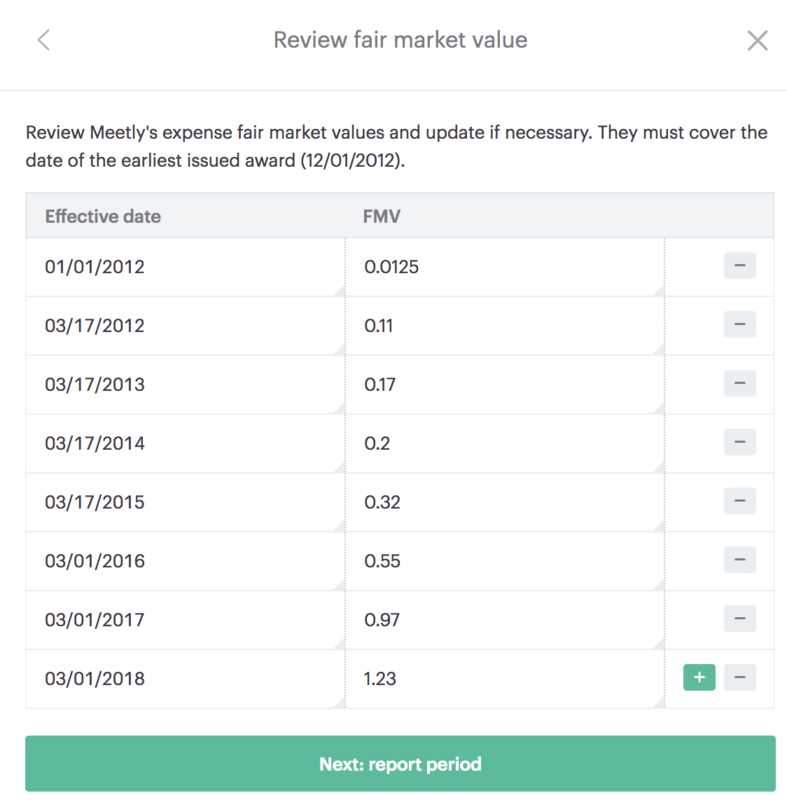 Within the Fair Values tab, we use an Index-Match function to find the FMV based on the grant date of each award. This table will reflect the inputs that you entered prior to generating your report. The Fair Market Values should match what you have in your 409a page. Carta uses the Intrinsic Value method to assess the cost basis of your Restricted Stock expense. This method simply takes the FMV on Grant Date and subtracts the Issue Price or $0 (depending on your specific company settings) to derive the basis of your expense for RSAs and RSUs. One thing to note - this tab will include RSAs, RSUs, and Certificates with vesting schedules attached to them. If you apply a vesting restriction to one of your certificates, our expensing module will view this as a Restricted Stock Award since you are applying a vesting "restriction". The tab with the naming convention of your reporting period will contain the expense amortization of each award broken down by vesting tranche. You will find the expense for the current period under “Current Expense Post-Forfeiture”. The “To-Date Expense Post Forfeiture” column will contain your cumulative expense for that particular tranche. The “Prior Expense Post Forfeiture” will contain the expense that was booked in the prior period. At a very high level, we will take the To Date expense and subtract the Prior expense to compute your Current expense. Please keep in mind that there are other factors that go into this calculation such as Forfeitures and Terminations. Every time you generate a report that crosses year end, you will automatically receive your annual minimum disclosures in the “Min Disclosure” tab. Click here to read more about minimum disclosures. The EE Expense tab will have your fiscal year’s worth of expense data and is used to calculate your yearly minimum disclosures. Please note that the data in the EE Expense tab may be different from the Jan-2017|Dec-2017 tab if your fiscal year is not January - December. Every time you generate a report that crosses quarter end, you will automatically receive your quarterly minimum disclosures in the “Quarterly Min Disclosure” tab. 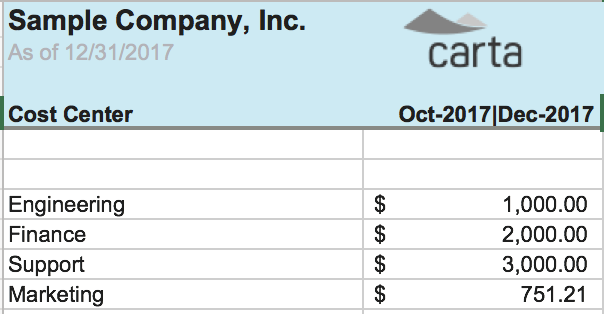 The Quarterly EE Expense tab will have one quarter’s worth of expense data and is used to calculate your quarterly minimum disclosures.